BeKAWS we love you, we are giving you a little update on FLABSLAB’s LINCOLN that we featured back December 2017 HERE. 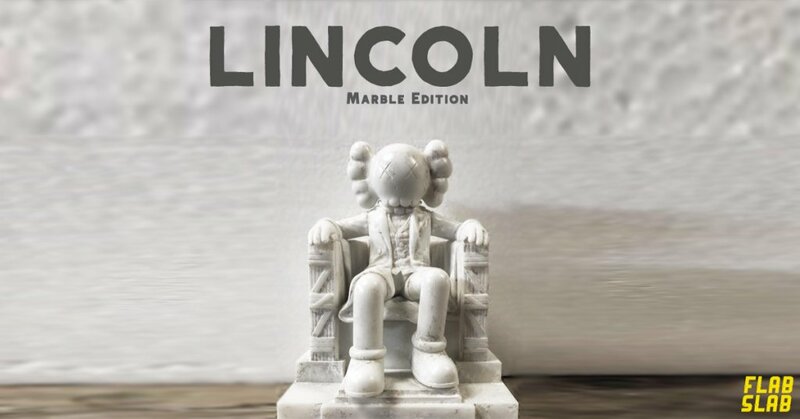 Progress has been made to the LINCOLN resin statue and the marble effect has taken shape! Like we said before, an ICONIC homage to the great Abraham Lincoln or the OE KAWS fans whichever way you want to take it. FLABSLAB poking fun at the near replica of the real colossal seated figure of U.S. President Abraham Lincoln sculpted by Daniel Chester French and carved by the Piccirilli Brothers. This LINCOLN statue is the biggest release from FLABSLAB to date, KAWSfuckbois ready to bow down the mighty LINCOLN? 10.5in tall a lord knows how wide or heavy Lincoln is you’d better make some space as it should be ready very soon! Hypbeasts are you ready for your President. Stay tuned for the release details.